This is Jesse's Girl. 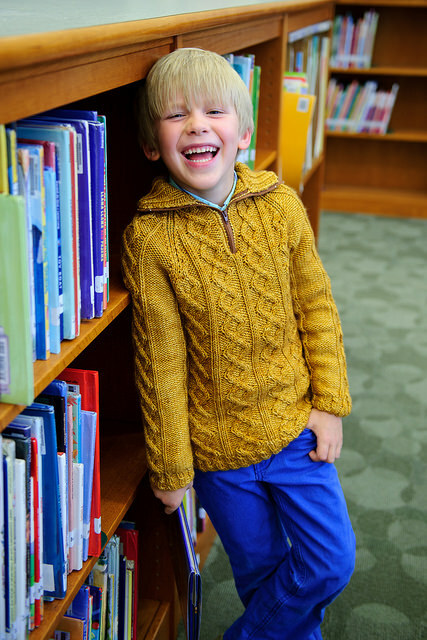 It was inspired by Jesse Half-Zip, a sweater that was part of my Knits for Boys book and is also now available as a single pattern. My husband and my oldest son share the name Jesse. My son is the 4th generation actually, so the name has been in the family for quite a while. He modeled the Jesse Half-Zip, of course. And so, I decided it was fitting for me to wear the Grown version. I openly admit that I made Erica spend WAY more time shooting this piece than the others because I knew I was going to have trouble looking at these photos of myself, ha! Both sweaters share a central cable pattern and utilize Anzula For Better or Worsted. I can't help it. Sometimes I accidentally have a favorite and from Grown, Jesse's Girl is it. It has all of the things I love. Squishy yarn with incredible color and depth. Textured fabric with cables that pop. Flattering lines. A scoopneck that I can accent with big sparkly jewelry. Purple. I had a "knitting disaster" with this sweater. I knit the entire body and then realized I needed to make an adjustment to the cable pattern. For a day or two I sat on it, trying to figure out a way around ripping the whole thing out. NOPE. I had to do it. Frogged the entire thing. It was painful. So painful. I had been petting those cables for several weeks. I forced myself to get right back on the horse and reknit it quickly before I had time to get more frustrated. As has happened every time I have made this kind of decision, I don't regret it. All in the name of perfection! This sweater is worked from the bottom up with raglan-style seamless sleeves. Shaping at each side flatters. I am a mom of four. These things are important. The shaping occurs outside of the underarm stitches in a sweet spot that works whether you are trying to create some curves or nicely accent those that are there without messing with either of the stitch patterns in the body. I have already had several comments from folks who would like to see this design in a cardigan version. I don't have any immediate plans to do that, but I am happy to share a few instructions on how you can accomplish this modification! It is really nothing fancy. It will be easiest to follow along with the Jesse's Girl pattern while reading these notes, but the principles are definitely applicable to other designs as well. Row 1 (WS): P1, k1, *p2, k2; rep from * to last 4 sts, p2, k1, p1. Row 2 (RS): K1, p1, *k2, p2; rep from * to last 4 sts, k2, p1, k1. Using the information in the existing pattern, fill in stitch count numbers for each section. During the following row, you should be able to establish the stitch patterns properly and then you can knit back and forth for a while without thinking too hard. Do not forget to leave your first and last stitch as selvedge sts (that is, work them as knit on the RS and purl on the WS throughout the entire project and don't include them in your cable set up). You won't need to modify the sleeves or the sleeve join. Next, determine your new center front neckline numbers. Subtract 6 sts (for the width you left out in your CO) from the total front neck stitches that are slipped to hold in the pullover and divide the remaining sts in half. The example below shows the smallest size. 22 stitches are slipped to hold for the front neck in the pattern. After subtracting 6 and dividing by 2, 8 stitches should be put on hold for each side. Work the remaining shaping just like for the pullover, taking into account that your end of row does not match the patterned end of round. Your stitch counts both in total and in each section should match up at this point. When you're all finished, pick up a multiple of 4 stitches plus 2 along those neckline stitches and use the same Ribbing pattern I provided for the hem. Row 1 (WS): *P2, k2; rep from * to last 2 sts, p2. Row 2 (RS): *K2, p2; rep from * to last 2 sts, k2. Your buttonband should be about 1.25" wide; place buttonholes as you like, with the top and bottom buttonholes about an inch away from each edge. If you need help placing the buttonholes, use the Scholar Cardigan instructions as a guide. Buttonhole instructions are included in the Technique section of Grown. I hope that sharing some of these notes with you is helpful! Grown is full of lots of tips and tricks to help you personalize your knits. After all, if you're making your own clothes, they might as well be just right. For more details about the entire collection, check out this post. Click here to buy it now. All the sweaters from Grown will be touring around in a Trunk Show next year, which is wonderful but kind of a downer for my closet. I would really really REALLY like to knit myself this sweater. Along with several others. But I've already admitted this one is my favorite so yeah... first up! Before I say goodbye, here's a photo of the other Anzula sweater in Grown, shown on my guy. This is is the Eli Cardigan.